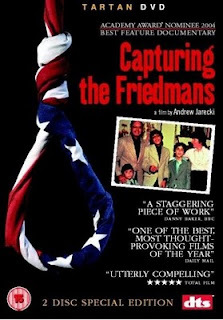 Capturing the Friedmans is a whirlwind of a documentary. It is like that drunk uncle at a party, that used to pick you up as a kid and throw you around in the air, and you didn't know if you were screaming of fear or excitement. And it all started with a clown, as director Andrew Jarecki wanted to make a short documentary about the best professional clown in New York. A cute idea, but nothing that would spark my interest. What he uncovered instead was this monster of a story. Although there is no violence or gore what so ever, this film still manages to be one of the most upsetting films I have ever seen, so much so that I still think about it regularly, seven years after I first saw it. Jesse Friedman pled guilty and confessed on TV (Geraldo). The movie “Capturing the Friedmans” left out the fact that there was a third defendant. The victims as adults have gone public with their being abused. Our research into the case shows that the director of the film sacrificed truth in favor of creating artistic ambiguity. Clear evidence is omitted and facts are distorted. In addition, the film relies on popular but erroneous myths about child sexual abuse. As a result, uncertainty is created about the guilt of two confessed pedophiles — who are recast as victims — while the real victims — the boys and their families — are portrayed as untrustworthy. wow, this info throws yet another twist to the story. Thank you for the update. Will read up on it. Maybe someone should make a new documentary? My documentary writing teacher showed us a bit of this doc. So where do I accidentaly find it? In the website where normally I get some very twisted films. And if you enjoy Capturing the Friedmans, you will most probably also enjoy the Paradise Lost films.